Our heads are manufactured through flanging and dishing. In doing so, the dimensioned circular blank is machined on a dishing press several times with up to 400 tons (= flanged), till the desired radius is reached. Subsequently, this arched disc is given a corresponding flange on a dishing machine (= dished). In this process, the diameter of the bottom is defined to the exact millimetre. 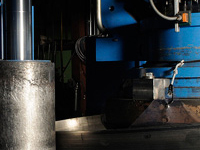 These methods enable the production of almost every diameter between 500 mm and 4300 mm. An advantage, which a lot of our customers already plan in their products. The term plasma characterises a special state of matter. Plasma is a dissociated and an ionised gas, which has the ability to conduct electrical current, but is itself electrically neutral to the outside. The electrical light arc is a suitable source of heat for generating a thermal plasma. Plates with a diameter of up to 5000 mm and strength from 3 to 20 mm are welded in our plants with a combined PLASMA-WIG method of the company SAF. This method guarantees economical and high quality welding results. Heads with a diameter of up to 4300 mm are ground in highest quality on the most modern CNC controlled grinding machines. We grind up to a value of: Ra 0.25, suitable for subsequent electro-polishing. The tests done as well as materials used are documented.